Ring in 2017 with a Champagne Vapor Ball – yours free just for logging in to WGT today, 12/31. These player-favorite virtual golf balls make any round feel like a party, with a fun cork sound and "bubbly" vapor trail. 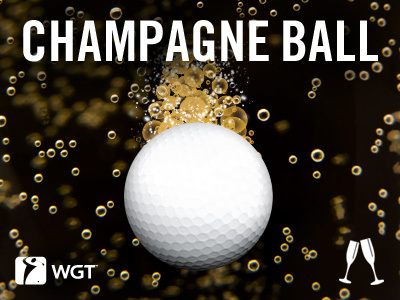 *Special offer for WGT players who log in and play WGT on 12/31/16, receive one free WGT Champagne Vapor virtual golf ball. "Putt" yourself first this holiday season and compete for a chance to win yourself a $100 Amazon gift card! 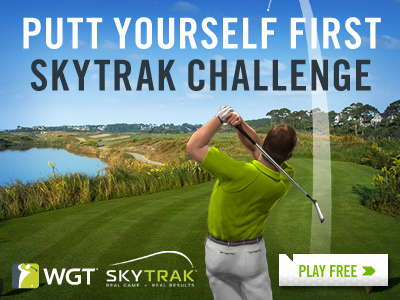 Play in the "Putt Yourself First SkyTrak Challenge" tournament this weekend for a chance to win a $100 Amazon gift card, to do some post-holiday shopping...spend it on yourself or someone special, you decide! This stroke play tournament on WGT runs through 12/31 and two lucky winners, including the top leaderboard score and a lucky sweepstakes winner chosen at random, will each win a FREE Amazon gift card for $100. *Open to all WGT players, but only eligible countries can win prizes. See tournament rules for details and eligibility. 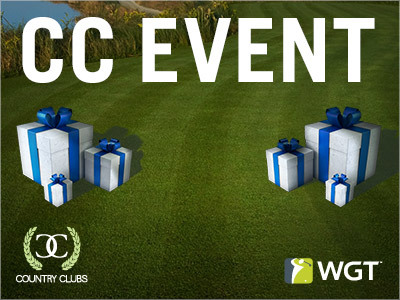 Time to pop the bubbly and ring in 2017 with your club in CC Event #38, going on now through Fri, 12/30. 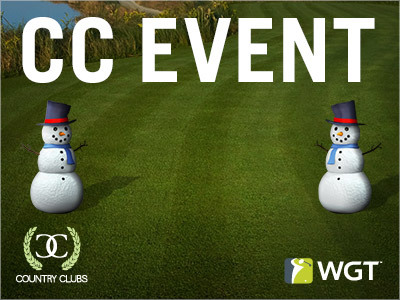 Play this week's CC Event today and tomorrow, to compete against other country clubs for club pride and in-game rewards including these frosty snowflake tee markers and flags – just in time for the new year! CC Event #38 runs 12/29-12/30, with multiple 4-hour Clashes, so be sure to play as many games as you can for your club and keep your eyes on the leaderboard. 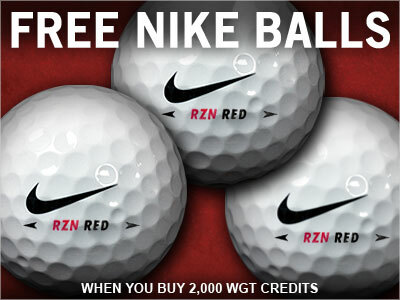 Our most popular offer is back to help close out 2016... Get 3 free Nike RZN Red virtual golf balls when you buy 2,000 or more WGT Credits today. *Special offer for players who buy 2,000 or more WGT Credits today through tomorrow (12/29/16-12/30/16), receive 3 free Nike RZN Red virtual golf balls (L40+). 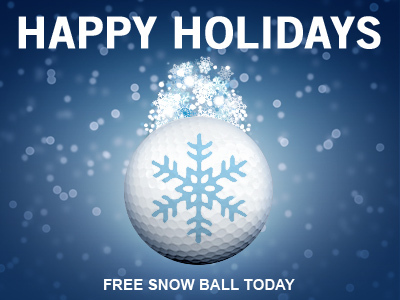 Get a free Snow Vapor virtual golf ball today 12/25, just for playing WGT! Take a break from the holiday chaos and play a round on WGT. Just for logging in, we'll give you a free Snow Vapor ball to add some winter flair to your game. This fun virtual ball gives you extra distance and durability, plus a snowy vapor trail to trace your shots through the air. 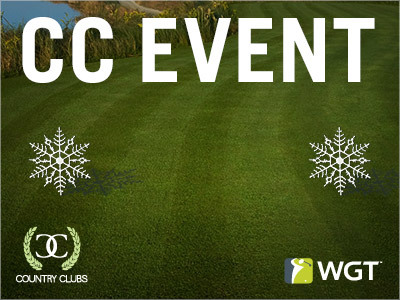 *Special offer for WGT players who log in and play WGT on 12/25/16, receive one free WGT Snow Vapor virtual golf ball. What are Custom Course Tournaments? Here's everything you need to know about new Custom Courses! WGT Country Club members can now create custom golf courses, made up of holes from any WGT course, and use them for Country Club tournaments. 1. 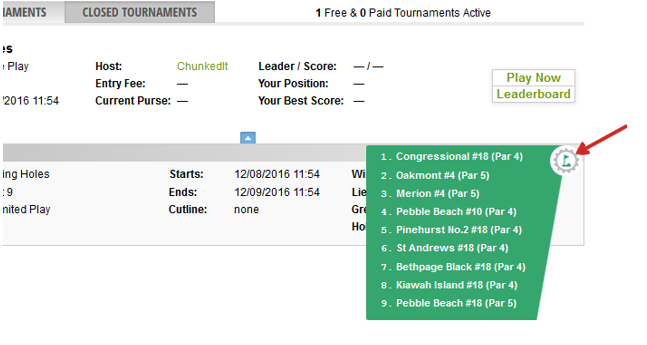 From your Country Club homepage, click the CREATE CUSTOM COURSES option under "CLUB TOURNAMENTS." Note: If you don't see this option, check with your Club owner about the selected settings. Owners can manage which players have permission to create new courses. 2. On this page, click the CREATE COURSE button to start building a new course. If you have any saved courses for your club, they will be listed here as well. Your club can have up to 10 saved courses at a time. 3. Next, select the holes you want to add from any WGT course and click the "SAVE" button. Select the WGT course, then the hole you'd like to add to your custom 9- or 18-hole course. 4. After you've created your course, start the "CREATE A TOURNAMENT" process just like you would for a normal country club tournament, but you'll need a Course Builder! When you're creating a new country club tournament, you'll see all the custom courses that have been created for your club in the list of available courses. 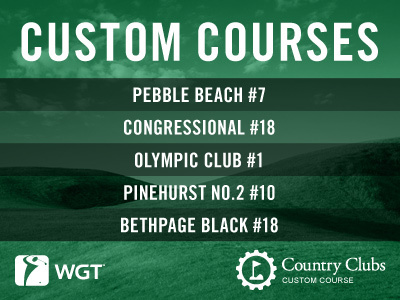 To publish a tournament using a custom course you'll need to have the NEW Course Builder currency, that you can win in CC Events or purchase in the WGT Pro Shop. You'll also see a number on the tournament setup screen that shows you the number of available Course Builders your club has. When you purchase Course Builders they go into your club’s account, not your own personal account. 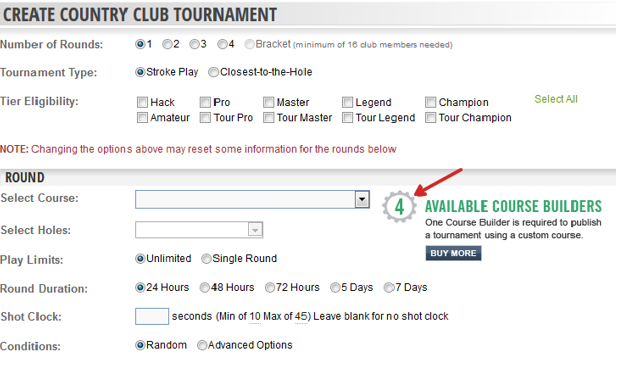 One Course Builder is required to publish each tournament with a custom course. To buy Course Builders for your club, go to the "ACCESSORIES" section of the Pro Shop. Note: tournaments with custom courses can only be created on the Web form, but can be played on all platforms. 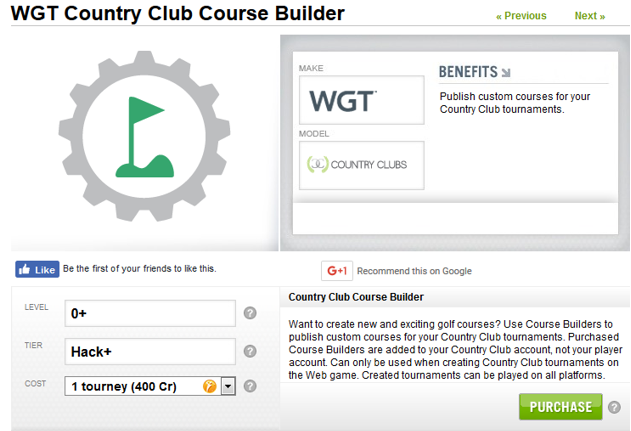 We've given each country club a free Course Builder (in your inventory now!) so you can create a custom course and start a tournament for your club. See what's new on WGT today, including the ability to create custom courses for your country club to play. And so that every WGT Country Club can try out this new feature, we've given each club one free Course Builder to create their first custom course and run a tournament! 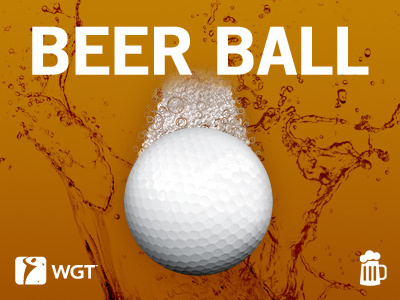 Celebrate special occasions or maybe just a long day on the job with a beer or champagne virtual golf ball on WGT! The Beer Ball on WGT features a foamy vapor trail and the Champagne Ball features a bubbly vapor trail, both to better trace your shot through the air. These virtual golf balls also make great gifts during the holiday season and can be found in the Pro Shop! 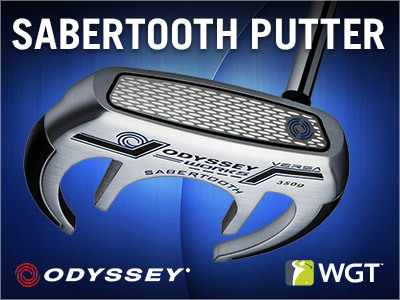 This new, high-level version of the popular Odyssey Sabertooth virtual putter is great for top WGT players that want to improve their putting and lower their scores. Unlocks at (Level 98) in the Pro Shop. Winter is coming here and so is CC Event #36 on WGT!